MARSHFIELD – The outcome of the final varsity football game at Beell Stadium came down to the final play. Marshfield senior kicker Mason Coffren, who missed a 23-yard field goal earlier in the game, came through in the clutch, drilling a 25-yard field goal as the clock hit zeroes to lift the Tigers to a thrilling 32-29 win over Pulaski in a WIAA Division 2 Level 3 state quarterfinal on Friday night. Click here to watch the winning field goal. 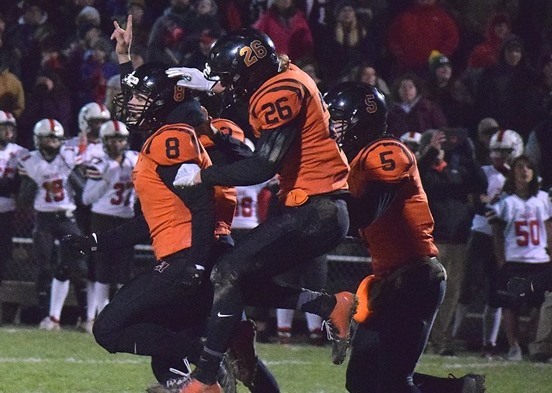 Coffren, who also made a game-winner on the final play of the game earlier this season against Kaukauna, made the field goal to cap a 15-play, 58-yard drive to chewed up the final 5:59 on the clock and sends Marshfield into the Division 2 state semifinals. The Tigers (12-0) will take on Mequon Homestead (12-0) at 7 p.m. Friday, Nov. 9, at Calder Stadium in Menasha. Coffren said the final kick came down to concentration and not making the same mistake he made on his miss in the second quarter. Marshfield head coach Denny Goettl said he felt confident in the senior kicker, who has come through multiple times this season for the Tigers. Marshfield trailed 29-22 after a 2-yard touchdown run by Pulaski’s Dylan Hendricks, who was a one-man wrecking ball for the Raiders. The senior quarterback ran 51 times for 369 yards and all four Raiders’ touchdowns. He finishes the season with an astounding 2,837 yards rushing and 32 touchdowns. Henricks’ final score came with 9:16 remaining in the game and put Pulaski on top 29-22. Marshfield responded quickly, needing just five plays to go 85 yards to tie up the score. Brant Bohman, who rushed for a team-high 139 yards, had runs of 12 and 2 yards. After an incomplete pass, quarterback Ryan Krueger sprinted up the middle for apparent 71-yard touchdown run, but an illegal block penalty turned it into a 27-yard gain. It didn’t matter as Bohman raced 53 yards on the next play and Coffren added the extra point to knot the score at 29-29. Marshfield finally found a way to stop Hendricks on the Raiders’ next possession. After two runs netted 12 yards and a first down, the Tigers’ defense stopped him to runs of 3 and 1 yards, and an incomplete pass before a punt. Marshfield took over on its own 42 and methodically drove down the field. The Tigers picked up three first downs on the drive, the final one on a 7-yard run around left end by Caden Pearce brought it down to the 10. Four plays later, Coffren kicked the game-winner to end it. “We just have to get a first down and move the ball,” Goettl said. “Give me five yards, who can we get going, who can hit it…Ryan was out there doing a great job. You put it in the hands of the kids to make the plays and when I wanted to get a first down, or I want to get some controlled yardage, I give it to Ryan and he’ll keep it. Krueger finished with 102 yards on the ground and two touchdown, and he threw for 160 yards and another score – a 15-yarder to Bohman on the Tigers’ first possession of the game. Marshfield piled up 269 yards rushing and 429 total yards in the victory. M – Brant Bohman 15 pass from Ryan Krueger (Mason Coffren kick), 9:01. P – Dylan Hendricks 31 run (Alec Jonet kick), 5:27. M – Krueger 6 run (Preston Wagner pass from Krueger), 10:42. P – Hendricks 4 run (Hendricks run), 9:31. M – Krueger 1 run (Coffren kick), 0:13. P – Hendricks 68 run (Jonet kick), 8:11. P – Hendricks 2 run (Jonet kick), 9:16. M – Bohman 53 run (Coffren kick), 8:05. M – Coffren 25 field goal, 0:00. First downs: Pulaski 18; Marshfield 17. Rushing (att-yards): P 57-392; M 43-269. Passing (comp-att-yards-int): P 0-3-0-0; M 9-15-160-0. Total yards: P 392; M 429. Fumbles (total-lost): P 2-2; M 1-1. Penalties (no.-yards): P 3-27; M 4-57. Punting (att.-avg. ): P 2-29.0; M 2-43.0. Rushing: P, Dylan Hendricks 51-369, Alec Jonet 3-14, Bo Bramschreiber 1-5, J.J. Szymanski 1-4, Brock Egnarski 1-0. M, Brant Bohman 20-139, Ryan Krueger 19-102, Caden Pearce 3-25, Isaiah Baierl 1-3. Passing: P, Hendricks 0-3-0-0. M, Krueger 9-15-160-0, Joey Goettl 0-1-0-0. Receiving: P, none. M, Preston Wagner 3-70, Bohman 3-49, Isaac Meverden 3-41. Fumble recoveries (defense): P, Nicholas Hanke. M, Alex Steines, Riley Boushack. Punting: P, Logan Kobus 2-29.0. M, Krueger 2-43.0. Records: Pulaski 10-2; Marshfield 12-0.